UC San Diego hosted a faculty panel titled 'What Fueled me to be First.' There were 240 students in attendance and had the opportunity build community with their peers and faculty members. 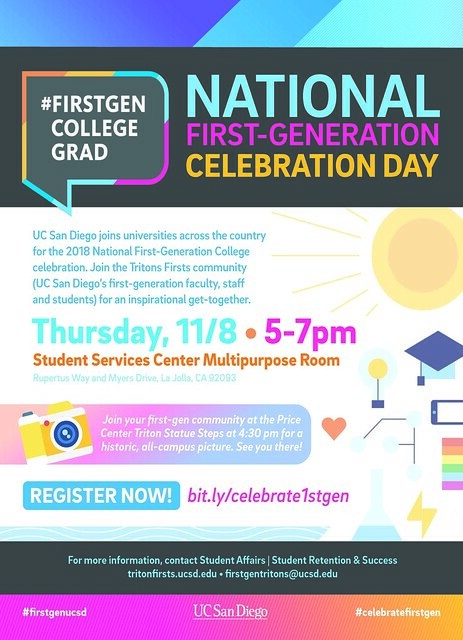 For the 2018 First-Generation College Celebration, UC San Diego is conducting several events to highlight the day. Student Affairs is hosting a campus wide signature event and photo opportunity. During the signature event a faculty member, a staff member, and an alum will be asked to participate in an inspirational fireside chat. The event will start with a poetry reading by a first-generation college student. Additionally, several departments will host micro events, such as a Grad Student Speed Friending Event for First-Gen Students, First-Gen Socials across the undergraduate colleges, and a First-Gen reception for engineering students.